Aksys is bringing Exist Archive: The Other Side of the Sky to PS4 and PSVita for NA on October 16, 2016. Looking to escape the mundane tedium of your everyday grind? Feel like life is lacking in the fantastical, god-slaying, dungeon-exploring department? Fellow RPG fans and professional reality-escapists, rejoice! 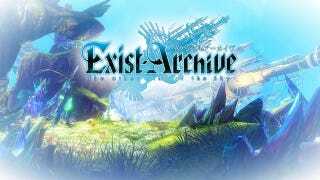 tri-Ace, architects of the JRPG series Star Ocean and Valkyrie Profile, celebrate 20 years of RPG mastery with Exist Archive: The Other Side of the Sky. Traverse sprawling 2D dungeons as you scour the realm for loot, monsters, and answers to your mysterious surroundings. Exclusive to PS4 and PS Vita, Exist Archive: The Other Side of the Sky looks to transport players to surreal landscapes and diabolic dungeons this Fall!